Keep communications equipment, such as Internet and cable-reliant services, up and running during outages. CyberPower provides reliable FTTx Telecom solutions including fiber to the premise (FTTP) and fiber to the home (FTTH). Our CyberShield™ FTTx Systems power communications equipment. 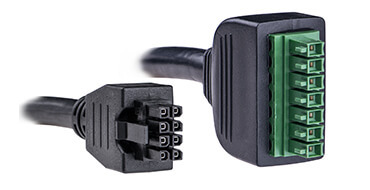 Our Telemetry Cables (FTTx/Telecom Cables) provide connectivity between power supplies and optical network terminals. Indoor CyberShield™ FTTx Systems from CyberPower supply continuous 12 VDC or 48 VDC (depending on model) to local power Network Interface Devices (NID), cable telephone modems, wireless base stations, fiber to the home Optical Network Terminals (ONT), and integrated access devices. They give cable telephone, wireless local loop (WLL), and fiber to the premise (FTTP) providers a dependable and cost-effective local power supply for customer premise equipment (CPE) during power outages. Features of the Indoor CyberShield Series include high-function design, cold start functionality, audible alarm signals with silencer options, microprocessor intelligent control, telemetry interface, optional extendable runtime, user-replaceable batteries, and LED indicators. Specifications vary by model. All models come with a three-year warranty. 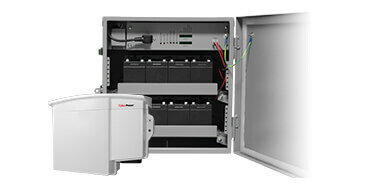 Designed for exterior installation, Outdoor CyberShield™ FTTx Systems from CyberPower allow service providers easy access to the power supply and battery. Outdoor mounting eliminates the need to schedule a service appointment with a subscriber to enter a residence or business location. 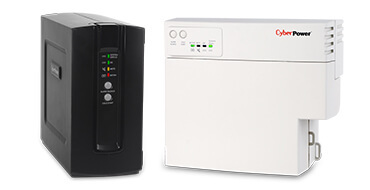 CyberShield outdoor battery backup products supply continuous 12 VDC or 48 VDC (depending on model) to local power Network Interface Devices (NID), cable telephone modems, wireless base stations, fiber to the home Optical Network Terminals (ONT), and integrated access devices. Features of the Outdoor CyberShield Series include high-function design, cold start functionality, audible alarm signals with silence options, microprocessor intelligent control, telemetry interface, optional extendable runtime, user-replaceable batteries, and LED indicators. Specifications vary by model. All models come with a three-year warranty.